As you may have noticed, I haven't posted anything here in almost six months. 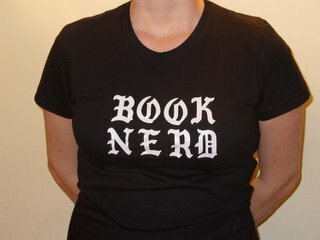 This blog served a great purpose for me for five long years -- from October 2005, when I declared my geeky book and bookstore love and my quixotic intention to open a bookstore. As you know if you've been reading me, that dream has come true. Which means any blogging time and energy I had is now dedicated to the bookstore. And to a degree, it also means that I don't need this outlet for my thoughts about book culture anymore, since I have coworkers and customers and a whole industry with which to explore them. Not to mention that there's a whole new generation of book bloggers who have a lot more interesting things to say! 1) If you are a publicist, please don't send books to The Written Nerd anymore. I get far more books than I could ever read through the bookstore (you can contact me there if you'd like to send me something or get in touch). If I do get books send to The Written Nerd, I'll know you're not actually reading my blog. 2) I'm still reading books, and I'd still like to talk about them, but in a much more low-key way. So I've started a Tumblr blog called A Small Book of Books, after the tiny notebook my first boss and mentor Toby used to record his reading. Feel free to read along. Thanks to all of you whom I connected with through this blog -- I'm so glad you've been part of my life, and I love where we're all going!